Last week was bookended by two major climate change events entirely driven by the media. It the beginning of the week, New York magazine released a doomsday article called article “The Uninhabitable Earth” addressing the direness of the situation; a sort of punch-by-punch account of how climate change will knock humanity to the mat. On Friday, Netflix released Chasing Coral, an emotional plea delivered with reality TV insiderness on how coral reefs are being bleached to death across the planet due to rising ocean temperatures. The New York magazine article took off, becoming the magazine’s most read story ever and generating a heated online debate between journalists, experts, and scientists over the merit and accuracy of the story, and of how to best galvanize broad climate action, or if that’s even a worthwhile journalistic goal. Meanwhile, readers came in droves to gape at the car crash that could be our collective future. All the hubbub eventually led to an annotated version of the article being published to clarify a lot of the controversial or potentially misleading information. Chasing Coral, on the other hand, met with a handful of uncritical reviews and a minor wave of coral reef panic that hasn’t amounted to much more than some colorful photos and language—at least not yet. I don’t have any numbers to show that more people read the article than watched the film—Netflix being Netflix, a weekend of chilling probably did yield a lot of views—but I am more focused on the impact beyond the source material anyways. I was surprised by how much feedback the doomsday article generated, considering it wasn’t breaking any news or going in hard on politics, and pretty much expected Chasing Coral would be met with a subdued welcoming reception. There is some irony here, as “The Uninhabitable Earth” was billed as a straightforward accounting of climate change’s risks while Chasing Coral is explicitly presented by the film’s primary narrator as a call to action. It shamelessly exploits the human element, thought to be so critical to climate communication, even featuring a highly likable camera tech and self-described coral nerd crying over the expansive death of corals he witnesses during the filming. So why such different reception? Is this a testament to the power of words versus images? Is the lack of an antagonist, controversial viewpoint, or human error in the film—all of which creates an outrage void—part of the problem? What exactly are we supposed to tweet about? Do we have collective coral reef alarm fatigue? Is it because humans are the centerpiece of the uninhabitable Earth in question, whereas a planet without corals will be pretty similar on the surface level as far as most people are concerned (at least until the rest of the biosphere goes the way of the corals)? The 7,000-word climate disaster opus is more intellectually stimulating, forcing readers to confront a number of unpleasant worst-case scenarios and to situate themselves and their actions within such a bleak, unpalatable narrative and future. Chasing Coral goes for the heart; and at the experienced hand of filmmaker Jeff Orlowski, who also directed 2012’s Chasing Ice, and marketing industry veteran turned coral crusader Richard Vevers, it does a pretty damn good job. My appreciation for the beauty, complexity, and importance of coral reefs was significantly enhanced, and my concern over the existential threat they face elevated several critical degrees. If anything, the film glosses over the science of what corals are and why they are dying a little too elementarily. It was clear enough that corals are made up of billions of coral polyps, and that they have a symbiotic relationship with the surrounding environment so rich in life, but I was left perplexed by a shot of the coral “mouths” with little further explanation of the lifecycle. But that’s probably nitpicking. Furthermore, climate change’s drivers and expected impacts were not a major focus, which was both a welcoming reprieve, but also perhaps a missed opportunity to hammer home the underlying point. Perhaps in the age the endless video pivot, we crave the intellectual stimulation offered by the doomsday article more than another Netflix documentary (or perhaps that’s wishful thinking). Even if the documentary did take far more time and resources to produce, the knowhow and opportunity to undertake deep reporting in the form of explainer-type journalism is something we come across less frequently in our regular media consumption. In the end, I think the answer to which is more worthwhile or effective is probably just whatever works for you. Climate change communicators have been trying to convey their message for several decades. Whether via an Al Gore documentary, an Elizabeth Kolbert book, or a Leonardo DiCaprio speech, nothing will make much of a difference by itself: A bit like a coral reef, it will take effort upon effort upon effort to amount to something that can no longer be ignored. Last week, we got two such valiant efforts. In the meantime, I am thinking of the lost corals, of which there are already so many— perhaps half of all of them. A coral reef is an ecosystem, and we are remarkably close to wiping out this ecosystem from the planet: An ecosystem that has endured for millions of years and evolved in remarkable ways. 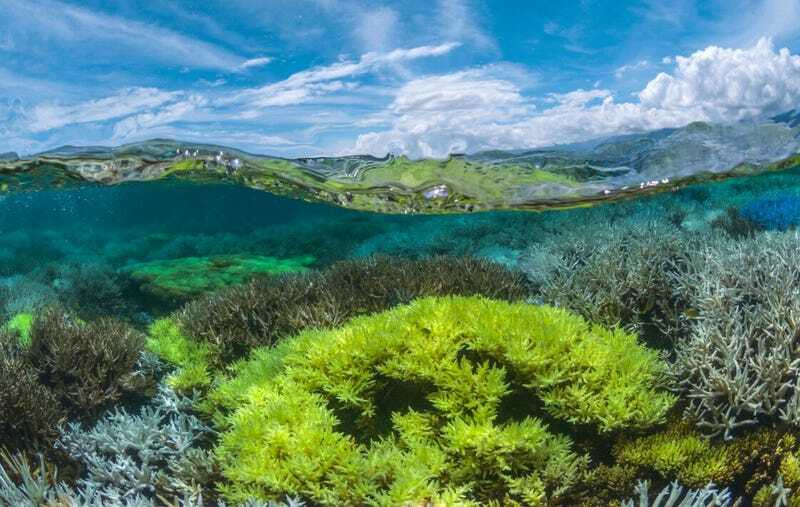 While the uninhabitable Earth for humans is much harder to make out clearly from the present partial-wreckage and continuously accruing science, many coral strongholds are already becoming uninhabitable for corals, and the science is very clear this is because of climate change. So it can happen, it is happening, and it could happen again.